Actually , I would say this sweater is more of a Goldenrod or Mustard than Yellow, but that didn’t sound good in the title…. I put together three looks on my trusty stand in, Scarlett to demonstrate how versatile it is to put together several looks with the same black and white color combo and my Land’s End thrifted boyfriend sweater. First up is a polk a dot skirt and ruffled neckline top. The texture and pattern here add interest to this look and would requie minimal accessorizing. in fact I would not wear a necklace due to the ruffled neckline, but perhaps bigger earrings and ,maybe pull up the sleeve and add a bracelet or two.. I love this printed sheath dress and am so going to wear this with black boots in the Fall or Winter. This dress stands on it’s own and needs no accessorizing , that ‘s saying a lot for a woman who loves her accessories! So this is the third and final look and you can see that all three have some pattern in the black and white combo. With the minimal stripes and lower neckline, a bold necklace was in order! My Anne Klein peep toes with white wedged heels! 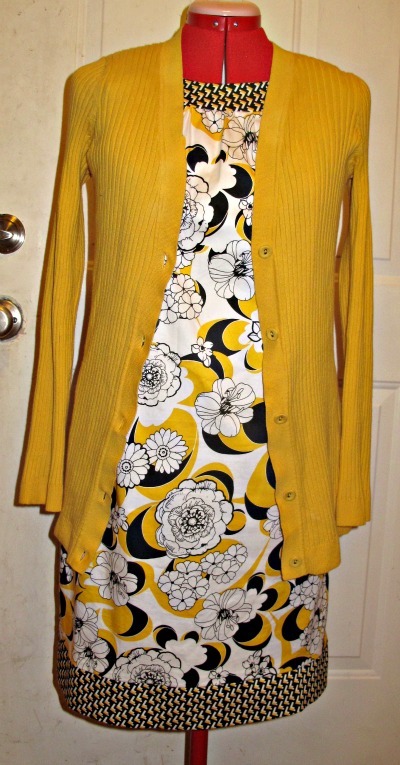 Dear Readers, this color combo reminds me of a bumble bee and as the daughter of two parents from Pennsylvania, my favorite football team, the Pittsburgh Steelers! I am so ready for football season1 There are so many ways you could play with this color combo and I hope I’ve inspired you to give it a try! What other color do you like to pair with black and white? Leaving the Gratitude up to you my Dear Readers, as these posts are all prewritten while I am on vacation..
so leave a comment of something you are grateful for and I will read them daily while on vacation! Really looking forward to this and would be grateful for your participation! 4 Responses to "Black & White with Pop of Yellow"
I love all 3 looks, but the 3rd is definitely my favorite! Today I am grateful that my little one got on the bus okay for her 1st day of school. She was nervous since it was her first time. I am loving black, white, and mustard myself. All of these are really cute. I just got the same mustard color in a necklace and button earrings from coldwater creek, sale, of course, $25.00 for the set. I have some aerosole sandals from a couple of years back in the same color that I’ve never worn…clearance, under $20. Just thought at first they weren’t comfortable, then tried them again recently, and voila, they are fine. ??? 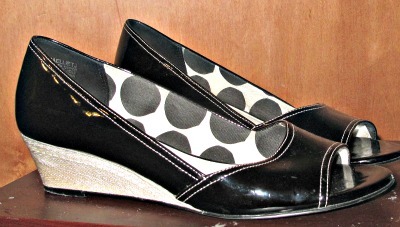 Then, the other night on chico’s sale site, they had the most adorable cork wedges, black with white polka dots, $19.99, only one pair that just happened to be my size. I clicked on Buy Now so fast it would make your head swim! So I am with you all the way on your black, white, and mustard, along with the polka dots. I have thought of tons of outfits I can put all of this with. Great looks, Tracey. My favorite has to be the first. 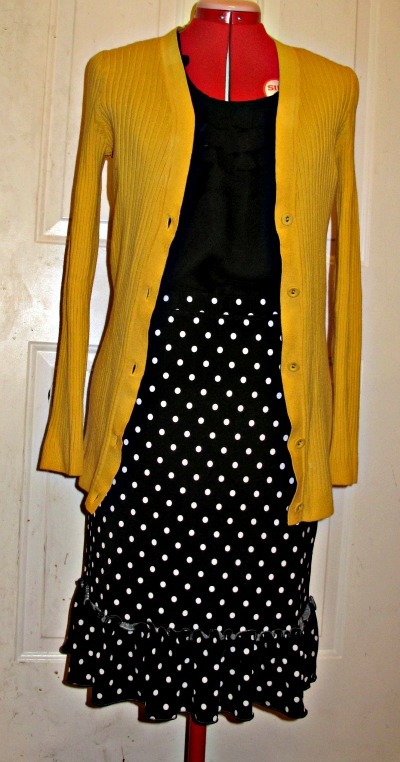 Cute polka dot skirt with ruffle. I’m grateful that even though I weighed a little more this morning I’m a far cry from where I was a few months ago and tomorrow is another day for me to keep working at being a better me. Hope you’re having a relaxing time at the beach house. Don’t you hate even gaining just a little back after losing it??? I gained on my vacation and am horrified!! !